There are too many fishes in the sea! While people use this phrase in an absolutely romantic sense, we cannot stop thinking about the real action which happens inside the water bodies. Indeed, there are different varieties of fishes in the sea! They come in different colors, shapes, and sizes. Speaking of variety, you may be aware of the popular fish names but we are here to add one more intriguing variety to the list. Say hello to the Albino Prestlenose Pleco fish who is also known as Ancistrus dolichopterus, Albino Bushynose, and Bushynose Pleco. They belong to the Loricariidae family and are known for their peaceful temperament. Found in the tributaries of South America, this fish does not have a myriad of colors on its body but are a visual treat for the sore eyes. As for the physical characteristics, the fish is brown in color with light spots. They don whiskers for easy food hunting! These whiskers are the highlight of this peaceful-looking fish. They are not typically large in size and will grow at a size of 5 inches. Did you know that this fish possesses a superpower? They have the power to camouflage in the natural surroundings. This keeps them safe from the evil predators. Additionally, they are very adaptable in nature and can easily swim in your water tank as well. Majority of the people prefer keeping this fish in their aquarium because they have the ability to keep the algae down. They are the secret tank cleaners, who do not grow too big and keep their surroundings clean. It is amazing how aquatic life is mysterious and beautiful at the same time! Each fish species have thrilling characteristics and it is intriguing to learn more about them. If you are planning to get home an Albino Prestlenose Pleco fish, it would be a wise idea to understand their lifestyle. Let us take a look at the elaborate details before making a decision! This fish breed is herbivores and any high-quality food would be ideal as their diet. It may seem uncanny to you but the Albinos love to graze on algae. If you are thinking of bringing this fish home, you need to know that they spend most of their time searching for food and eating. Give them a good variety of food and ensure that it is a bottom sinking pellet because they usually eat food from the bottom of the tank. Their diet should consist of 15% protein and 85% plant. If you do not wish to spend on fish food, you can even give them fresh blanched vegetables. These fishes are not fussy eaters and will be happy with cabbage, carrots, peas, zucchini, and cucumber. Make sure that you remove the uneaten food because it could lead to water fouling. The uneaten food should not remain in the tank after 24 hours. If you are giving them meaty food, keep it about 10-15% of their diet as that would be enough to keep them healthy. When these fishes are breeding, the food requirement changes. Breeding fishes should be given live bloodworms and black worms. Feed them on a regular basis but keep control on how much and how often you feed them! Overfeeding is a strict NO! When you own a pet, it becomes difficult to understand their needs because they do not have a similar language to express what they feel. However, it is best to feed them twice in a day! Overfeeding is the main reason behind fish loss! The over-ingestion of food is toxic for the small fishes. You need to understand that they are not human beings or dogs! They have a small belly and can eat as much! Giving them food once or twice in a day is going to be sufficient. This fish needs fiber in their diet to remain healthy. Place driftwood in the tank as these fishes will love it. You can also provide frozen and live foods to them. This includes live black worms and blood worms. As we mentioned before, you need to make sure that the food reaches the bottom of the tank because they will never notice it anywhere else. In case they start eating the plants inside the tank, it is a sign that you are not feeding them enough. Take a close look at the color on their body! If they are healthy and are being well-fed, their color will be vibrant and good. Consider them shy or conservative, the Albino Prestlenose Pleco needs a cave to get into action. If you are getting these fishes for breeding then place some caves inside the tank. It is fairly easy because they will do the rest once you have given them privacy. Additionally, you must keep more female fishes than the male as the latter tend to be territorial. They will quickly choose a cave to start the breeding process. The male fishes tend to fight with each other for the caves and can easily indulge in a caviar meal. What does this mean? If there are too many male fishes and one gets control over a cave, then it is possible that the others will eat up the male for eggs. Savage, right? That’s how it works with them and that is precisely why you should have more of the female fishes in the tank. How does a breeder know whether it is a male or a female fish? The male Bristlenose have larger bristles whereas the female ones have bristles around the mouth. Additionally, the female ones are smaller than the male version. When the male bristlenose is ready to breed, he will start to hollow out a cave and clean out the surface. Do take note of their fatherly instinct because they make space for the upcoming eggs. It is a common belief that fishes do not entice each other. This is untrue! The male fish knows the art of seduction and does it efficiently. The male Bristlenose tries to lure the female fish to enter his cave for further scrutiny. That’s when they both are ready for breeding! The female fish deposits the bright-colored eggs in the clean space and that’s when the cold-hearted and protective male fish shows his true colors. Once the eggs are safely deposited, the male will bid adieu to the female from the cave and protect them. That’s right! The male bristlenose does not display affection towards the female after she has deposited the eggs. As for the number of eggs a female produces, it ranges between 20-200. He pushes the female out of the cave and protects the eggs. Like we said before, they are highly territorial and plan the breeding strategically. While he is protecting the eggs, other female fishes may get attracted to the same cave. It is possible that the eggs will be fertilized by several female fishes. It is intriguing to know that the female has no role in caring for the eggs. While dogs, cats, and even human beings care for their offsprings, the male Bristlenose protects his eggs until they are free to swim. He takes care of the eggs for about 10 days until the kids are ready to leave! He will clean up the nest, remove the bad eggs and even aerate them. Also, the male does not leave the nest and if he does, it will be a short trip to hunt for food. It takes about 4-10 days for the fish eggs to hatch. The male fish will protect the fry till they are ready to swim out on their own. Once hatched, these small fishes will grow very fast and will be the same size as their parents in just 6 months. They start feeding on algae once they are freely swimming! You can even give them mashed vegetables such as zucchini and peas. The Albino Prestlenose Pleco has a life-span of 5 years. They do not live as long as any other pet like a dog or a cat, but they make your aquarium look stunning! If you wish to keep this fish interested, give them lots of hiding spaces inside the aquarium. Consider placing some caves inside because they love the hiding game! They require space to move around, eating and searching for food. It is a no-brainer that a fish does not have much to do inside a tank. Additionally, the peace-lovers have a great fondness for long naps. It would be wise to keep a big tank because they love to relax at the bottom. The pH level of the water should be between 6.5-7.5 and the temperature should be 60-80 F. In a nutshell, it is easy to take care of this fish. You just need to ensure that the tank has about 29 gallons of water. A strong filtration system is much-needed. This is because these fishes are big on pooping! Since they constantly leave poop behind, a strong filtration system becomes necessary. In a nutshell, it is fairly easy to keep them. If you are a beginner, consider getting this breed in your tank. However, you must choose an adult fish rather than a baby fish because the younger ones cannot keep up with the pH level of the water. Change the water bi-weekly and keep a close check on the nitrate level, organic matter, and phosphate. It is important to change 25% of the water in the tank every other week. The Bristlenose pleco should not be overfed. It is possible that the fish may die because of overeating. Giving them food once or twice in a day is enough. The aquarium hardiness should be medium. Our usual thought process is that fishes stay happy inside the water. How do we know that these fishes are happy or not? It is possible that the fish is not getting enough food. If they have a good coloration on the body, the fishes are healthy. Keep the tank clean and give them enough food. This will keep the fish healthy and happy! Additionally, there should be enough hiding places inside the tank. You can place driftwood and caves inside the tank. If the tank is healthy and clean, you will not see any sign of diseases. However, it does not mean that the fishes will not feel ill for the whole of 5 years. You must read about the common tank diseases! Since this fish is very peaceful in nature, the symptoms may get unnoticed. With a high nitrate level in the tank, it is possible that they might get infected barbels. The nitrate level should be below 20 ppm. If the nitrate level is high, it would be difficult for the fish to eat or navigate. If you wish to avoid this from happening, keep them in a healthy tank environment. Giving them a healthy, balanced diet and keeping them in good conditions is advisable for a healthy and happy fish! Also, any type of fish should not be overfed. Overfeeding can lead to death and that’s precisely why you need to set a time for feeding them. Give your fishes enough fiber, pellets and fresh veggies. This will ensure that your fish is content and healthy! Just ensure that anything that you put inside the tank does not have bacteria. Clean every object that you put inside their habitat because bacteria can cause diseases easily. This goes for any other fishes that you plan to put inside the tank. Giving them a healthy environment and proper food is absolutely necessary! Every fish is known for their social behavior. For example, the piranha may be known as the man-eating breed but most of them are actually very docile and harmless. Similarly, the Albino Bristlenose Plecos are peaceful in nature. We shall talk about their social behavior but one needs to understand what this fish likes doing! The Bristlenose likes to spend time at the bottom of the tank. You will usually find them napping or searching for some food. When it is time for breeding, they become highly territorial and protective. They are protective about the fish eggs and will guard them till they are freely swimming in the tank. Give them enough space and food, these bristle nose fishes are known for being peace-makers and do not cause a lot of trouble. As a peace-loving fish, they get along with most of the community tank fishes but do not mess with them during the breeding season! The male bristlenose tend to fight with other male entities for the cave. If one male shows authority, it is possible that the other male fishes will eat up the caviar! Do not keep too many male fishes inside the tank because that could create a lot of ruckuses inside. As for the other fish breeds, the Bristlenose will make peace with any type of fish! If they find any aggressive tank mate, they have defense armors. Don’t forget that these fishes have bristles and can easily save themselves from the aggressive tank mates. As human beings, we are social creatures and need constant socializing. Whether it is in school, college, office or even in the neighborhood, we always like company. The same goes for the fishes! 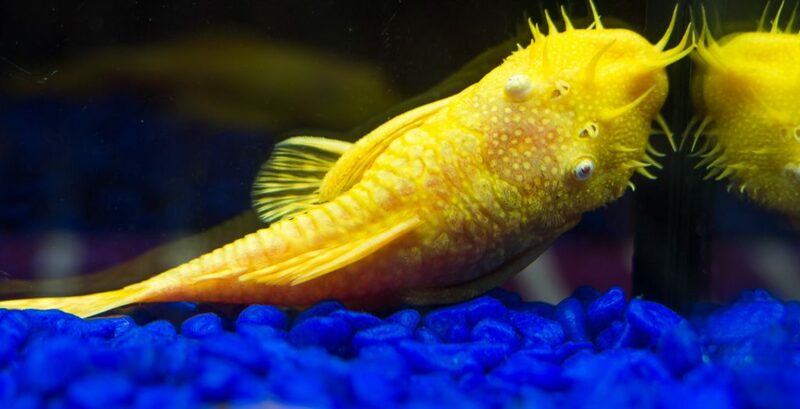 While the male Bristlenose plecos are highly territorial and nasty to each other, there are some other fish breeds who can get along with this breed. Although it is not necessary for this fish to have tank mates because they spend most of their time napping on the bottom of the tank. You can even see them sucking up the glass and looking at you. Since these fishes are peaceful in nature, they will get along with most of the fishes. Do not keep aggressive fishes inside the tank as these fishes have bony armors. As we said, do not house two male Bristlenose plecos together as they are very territorial and can eat up the foe eggs! Did you know that calling the fish by its full name is considered to be bad luck? People usually refer to it as ‘Plecos’ and not ‘Plecostomus’ because it is a common belief that taking the full name is inauspicious. If you take the full name, you will soon see a dead fish inside the tank. This is a popular belief and you may or may not follow it. However, it is nice to call this fish ‘Pleco’ instead of working too hard to pronounce the full name. The Albino Bristlenose Pleco are excellent tank cleaners. They will feed on the algae and keep the surroundings super clean! The Albino Bristlenose Plecos are easy to breed and that’s precisely why they are often bred. They are nocturnal creatures but once you put driftwood and hiding places, they will have a great slumber!